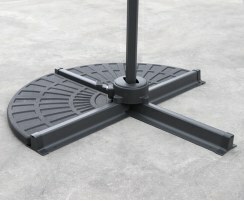 HDPE concrete filled parasol bases are essential for keeping your outdoor parasol upright and secure. Our heavy duty parasol bases and stands will complement modern surroundings whilst keeping your garden parasol safe. Our concrete parasol bases and stands are suitable for use at home in gardens or patios, and for commercial use in pubs, cafes and restaurants – order today for complete peace of mind. 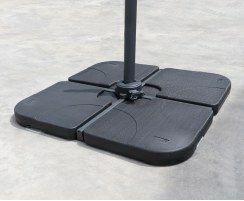 These HDPE concrete filled parasol bases will keep your parasol from falling over or blowing away. For total peace of mind, browse our full range of heavy duty parasol bases and stands now to complete the look of your parasol and to enjoy the cooling shade from the summer sun. For your safety, always use a garden umbrella stand with your parasol.